Inland Water Transport (IWT) has its forerunner set up in 1865. At that time the organization functioned as a private enterprise under the name of Irrawaddy Flotilla Company Limited (IFCL). The IFCL was nationalized on 1st June 1948 after (Burma) gaining Independence from the British Colonial Rule. Under the plan to provide new administrative order, "Inland Water Transport Board" was renamed as " Inland Water Transport Corporation" in 1972 . It has been changed to the present name of "Inland Water Transport" with effect from 1st April 1989 It is one of the state owned enterprises under the Ministry of Transport and Communications, MOTC), the Union of Myanmar, operating the functions on transportation in inland waterways. It has been operating the services of passengers and cargo transportation for the regions with navigable waterways in such rivers as the Ayeyarwady, the Chindwin and the Thanlwin, and for Delta regions and the regions in Rakhine State. 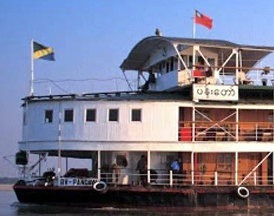 Yesterday I watched a television documentary called "Burma's Forgotten Fleet", which is about the steamboat ferries of the Irrawaddy Flotilla Company, which was the world's largest river fleet during the times of British colonization. After Burma's independence the fleet has come under the control of the government agency known as Inland Water Transport, which to this day fly the flag illustrated here as a house flag (at the jackstaff, even when under way). Another interesting point is that although currently the (Myanmar) national flag is the proper civil ensign, a small number of ferries seem to continue to fly old surplus pieces of the former civil ensign, apparently without much political repercussions. The flag in the photo seems to be green, yellow, blue, diagonal. Perhaps there is a mistake in hoisting it. The emblem is a disk with three colours in the diagonal and a black anchor. According to the IWT website, the flag has a ratio of 4:5 (1x1.25) and the green represent the forests, yellow the fields and farms and blue for the rivers and lakes. Date of adoption is not known.